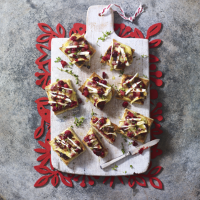 Try these delicious Christmas bruschetta - perfect party food as they're easy to make and some of the preparation can be done in advance. Heat the oil in a small saucepan and cook the garlic for 1 minute. Add the cranberries, sugar and thyme and cook for 5 minutes, stirring until the cranberries soften and release their juices but still hold their shape. Separate the focaccia into 4 rolls then slice each in half horizontally. Place the focaccia halves on a grill pan and toast lightly on both sides. Spoon the cranberries over the cut side of the focaccia and lay the cheese on top, then drizzle with some of the pan juices. Return to the grill for 2–3 minutes until melted. Arrange the bruschetta on a serving platter. Drizzle lightly with balsamic vinegar, garnish with extra thyme and serve immediately. Get ahead by preparing the cranberries to the end of step 1. Chill for up to 3 days then warm through before using.